KEVINMLD: How creepy were the masks the bad guys on page 2 and 3 were wearing. Very cool design. PTB: Totally creepy, to the point where it was hard to tell at first that they were men in masks and not mutants with snakeheads. The believable design sold the creepiness. Honestly, the first five pages of the book looked incredible. Not that Capullo hasn’t put together some masterful pages, but I’m crediting a lot of what I’m liking about it to colorist FCO Plascencia. The page where we first see Batman in the issue is one of my favorite images from the series so far. KEVINMLD: The scene of the low tech Batman on a dirt bike with the 1939-style purple gloves made me grin from ear to ear. PTB: It’s a great page that immediately captures something really cool about both the broken condition we find Gotham in and where Batman fits into it. The art makes a dramatic shift as the story moves back in time to show how Gotham got this way, but it’s equally captivating. The action intensifies and the army of the Red Hood gets an immediate upgrade as a threat to Batman. KEVINMLD: We’ll see where they go with this Red Hood story. If he’s not the Joker, I’m not sure I’m particularly interested in him. PTB: I get that. Admittedly, I’m a casual Batman fan to the point that I sometimes have to remind myself that the Red Hood was the Joker before the accident. Given the way Snyder has presented his version of the Red Hood, it’s possible that the Joker could be the leader of the gang, or any one of his agents. Would that work for you if we learn someone else is pulling the strings? I seem to recall the Red Hood was working for someone in the previous stories we’ve read. Maybe the Falcones? KEVINMLD: Yeah the Red Hood was never really an actual ring leader before as far as I remember. He was just a suit that some bad guys would make various petty criminals wear to appear as a ring leader. The Joker being the only one I ever remember becoming significant. Snyder uses Alfred very effectively as the voice of reason in the scene where Bruce tries to run down the Red Hoods with the truck and the censored label cracked me up. I didn’t see that coming. PTB: That scene really sold the notion that we’re seeing a younger brasher Bruce Wayne on the streets of Gotham. KEVINMLD: I love the design of the “What do you love about the city, Bruce?” page with the wandering child version of Bruce Wayne. PTB: I think what this story might be doing best at the outset is giving us something other than the Batman origin story that we’ve read before. It seems more like we’ll be seeing how Bruce becomes “BATMAN!” here. KEVINMLD: Is it wrong that I’m really bothered by the fact that when Thomas Wayne shows up he’s super young and doesn’t have a mustache. Thomas Wayne has mustache, Greg. Come on. Get it right. PTB: Now see I don’t immediately think mustache when I picture Thomas Wayne. This isn’t the first time we’ve seen him in this series and I don’t recall a mustache in previous appearances either. Maybe that’s the secret of the New 52? Thomas Wayne shaved his mustache and changed the entire course of the DC Universe. KEVINMLD: I’m also not a big fan of the Riddler suggesting Uncle Philip just kill Bruce. The Riddler when he’s at his best isn’t just a killer. Batman has enough foes that are heartless killers. The fact that the Riddler is not one is part of his appeal to me. Having said that, he’s a character that gets reinvented every fifteen minutes and I’m pretty sure Tony Daniel portrayed him as a killer just before the New 52 launched, after Paul Dini had pushed him as a shady P.I. working mostly on the side of the angels. So it’s not without precedent for sure. I’m just hoping Snyder does something interesting with him. PTB: I don’t know that I’ve ever read a single in-continuity Riddler story. In fact, I’m more a fan of his appearances in the Arkham video games than anything else. I’m not ready to write Snyder’s version off as just another killer yet, it seems killing Bruce is simply the most logical solution to the problem. KEVINMLD: The back up drawn by Snyder’s American Vampire side kick Rafael Albuquerque is reminiscent of a recent story over in that book that focused on a drag racing vampire killer in the fifties, but overall it’s an enjoyable short story showing off where Bruce learned to drive the way he does early in the issue. 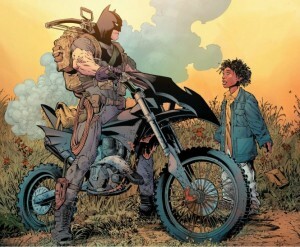 PTB: Have we seen Bruce’s training days in the pages of Batman or Detective Comics previously? Batman Begins gave some details on the big screen and that is the first thing that comes to mind when I think of that era of his life. KEVINMLD: They’ve explored his training a ton over the years going back at least to the ’70s. One of the other current books, maybe Detective, has even focused on it lately with the reappearance of a weird supernatural, ninja shadow killer with ties to his past. 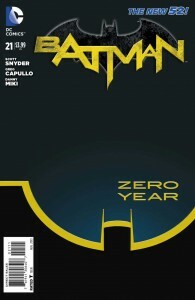 DC recently announced there will be Zero Year tie-ins across the Batman line later on this year. Talk about overkill, I don’t really think EVERY story Snyder writes needs to tie into the other batbooks. I’m pretty sure the creative teams on those other books would agree. PTB: I didn’t read any of the tie-in issues for Night of the Owls or Death of the Family. I always worried that I was missing something. I wasn’t, but I do sympathize with readers of those books. The publishing/marketing aspect of comics has a history of hurting stories. KEVINMLD: There were some good stories tied to Death of the Family to be honest. But were they better than what the teams would have done had they been allowed to follow their own paths? I don’t know. Overall, I think this is a very solid start to Snyder and Capullo’s Batman Zero Year. I’m looking forward to seeing where they take it. I hope the momentum of the story isn’t killed by Villains month in September. 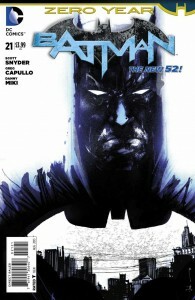 PTB: I didn’t think I was looking for another event from Snyder and Capullo‘s Batman, but I’ll take it. The recent two-part Clayface didn’t do much for me, and their longer format stuff is definitely what’s keeping me around. I can’t imagine Villains month will derail things too much with the Riddler, Red Hood, and ostensibly the Joker front and center in this story. I might not fully understand what villains month entails though. KEVINMLD: In September DC will publish none of their regular titles. In it’s place will be books starring their villains like Joker #1, Riddler #1, etc. There also will be the kick off of the first major New 52 event series called Forever Evil.